Cleaning your home on a regular basis requires a lot of your free time – time that you probably don’t have. Luckily, you can always find exceptional house cleaning Houston, TX experts to help you out and take over your cleaning chores while you dedicate yourself to your passions. You will also not have to worry about detailed cleaning of your home when company is coming over. You can even throw a house party and not worry about post-party cleaning! However, there are some essential tips on how to choose a cleaning company that can help you find the right people for the job – cleaners with the greatest level of expertise. The leading cleaning professionals can even teach you how to clean your house faster! The age of the Internet has brought everything to our fingertips. You can now find a cleaning company in just a few clicks. However, you need to find the right cleaning company that will meet your cleaning needs, leave your home in a squeaky clean condition and give you absolute satisfaction. You can achieve this by simply looking at your options. After diligent googling and asking your friends for recommendations, select the most reputable and reliable companies and check their previous clients’ satisfaction. In addition, check how long a particular company has been in the business. You need to find out whether a company you want to hire employs a certain vetting system for the cleaners they work with. Make sure to ask whether they perform background and reference checks to make sure you’re welcoming reliable and trustworthy cleaners into your home. Don’t forget to inform yourself about competence and performance assessments. This will ensure that you get an above-par service and exceptional customer experience. It’s crucial that you choose a reliable company that works with insured and bonded cleaners. This will protect you from any legal liabilities if cleaners experience an injury while in your home. What’s more, your property will also be covered in the case of damage. There are several additional tips that will help you hire the perfect cleaning company. You should take a look at the list of their services and see whether they offer the ones that you need. Don’t hesitate to ask what a certain cleaning service exactly entails. Also, availability is another factor that you need to consider, especially if you might need emergency cleaning. Last, but certainly not least, pay attention to the payment and pricing system. Typically, flat rates and hourly pricing are available depending on your preferences. Before hiring a cleaning company, consider what your cleaning needs are and what type of service you expect. If you prefer green cleaning products, make sure to ask whether a certain company offers them. Knowing what you need will help you choose a cleaning company more easily. 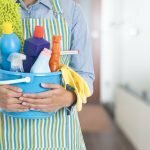 How to choose a cleaning company? Better call That’s Clean Maids! Looking for the most reliable cleaning company? Perhaps your safest bet is to go to a renowned referral agency instead and lucky for you, that’s us! That’s Clean Maids will undoubtedly meet your cleaning needs as we go above and beyond to make our clients happy. Let us start by taking over the lengthy and complex task of finding you first-class cleaners. We will move Heaven and Earth to match you with top-notch cleaners who will give you back your precious free time. While they work hard to make your home spotless, you can take some well-deserved time off! They’ll clean your home efficiently, leaving no speck of dust behind. They can tackle any cleaning task, so just let us know what you need and leave the rest to us. To top it all, getting in touch with us is cakewalk. Book now and see for yourself!